Today's tiara is a lesser-known member of the Norwegian royal collection, but one I wouldn't mind seeing more often. 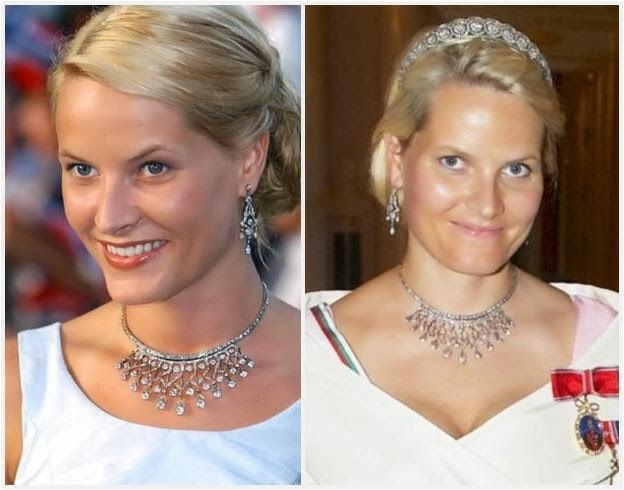 The tiara is a smaller piece in a fan shape ("vifte" means "fan" in Norwegian) composed entirely of diamonds set in gold and silver. 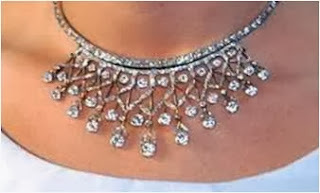 It can be worn upright in the hair or worn on a diamond necklace. It may be a petite tiara, but it has grand origins: it is said to have been a gift from Queen Victoria to her granddaughter, Princess Maud of Wales, to mark Maud's 18th birthday in 1887. Maud was the daughter of King Edward VII and Queen Alexandra; she married Prince Carl of Denmark, who in 1905 became King Haakon VII, first king of the newly independent Norway. The Vifte Tiara came with Queen Maud to Norway, and there it remains today. 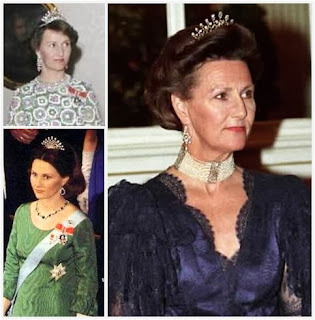 The tiara was inherited by Maud's grandson King Harald, and has been worn by his wife Queen Sonja (who started using it during her years as crown princess). More recently, it has been worn a couple of times - as a necklace only - by Crown Princess Mette-Marit, who first wore it to her pre-wedding celebrations. It's not worn often, which is probably not a surprise given its unique shape and small size. But I do wish we'd see it more; this little tiara plus a skilled hairdresser could yield fantastic results (it has some serious My Fair Lady potential, no?). What do you think: serious potential, or seriously too small? 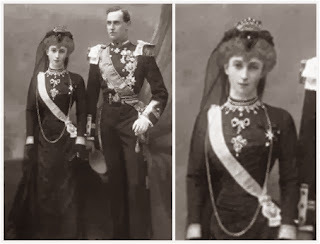 Update: Illustrations uncovered at the Royal Jewels of the World Message Board indicate that this tiara was a wedding gift to Queen Maud from the Rothschild family, rather than an 18th birthday gift from Queen Victoria as has been most frequently reported.